Our celebration of American Founders' Month here in Florida continues with a look at Benjamin Franklin. Mr. Franklin may be one of the most fascinating of the people who contributed to this country during the Founding Era. He was known for his wit, his charm, his brilliance, and yes, even his way with the ladies. He may be introduced to younger kids with the story of his decidedly unwise but ultimately legendary act of flying a kite in a thunderstorm, but truly, he was so much more than that. 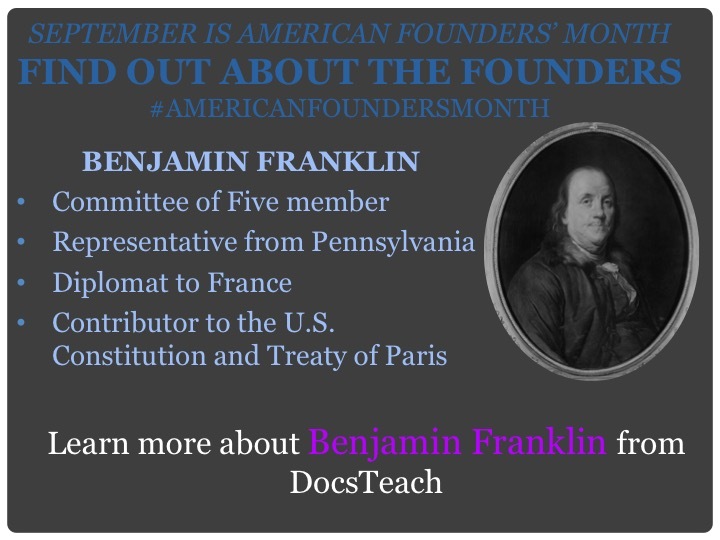 Take some time and check out this great DocsTeach resource on dear Mr. Franklin's time as a politician and diplomat! And the wonderful musical 1776 is always worth checking out for some excellent historical debates and discussions. Here, Benjamin Franklin talks about what makes Americans different from their English cousins, featuring some of the wit and charm and especially intellect and passion he was known for (relevant clip begins around :34).